Last weekend we had stamp club, so I thought I would share our cards with you. 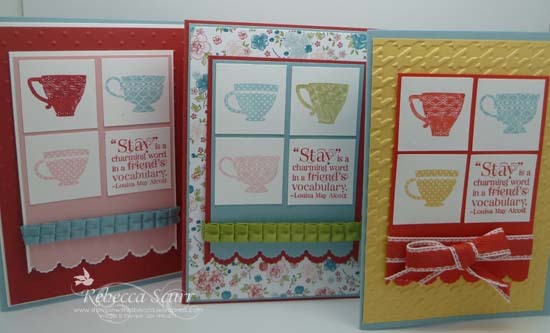 I focused on some of the new stamp sets and fabulous new tools available in the latest Autumn Winter mini catalogue. 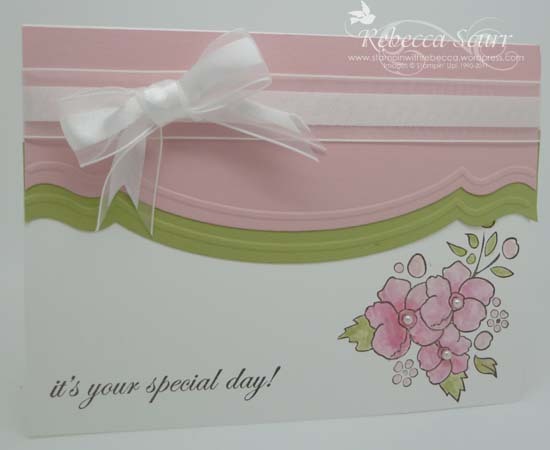 This first one focuses on the Adorning Accents edgelits and the matching embossing folder, including the co-ordinating stamp set, Bordering on Romance. Once you get the hang of the edgelits, they are very easy to use and look absolutely fabulous!! I did case this one but I can’t find where. The next card is cased from here. I used it as my inspiration but I used different colours and different stamps. I made the rosette using the new Simply Scored which is great. It makes making rosette’s so easy!! Accessories: Lace Ribbon Border punch, 1 3/4″ scallop circle punch, 1 1/4″ circle punch, Scallop Circle #2 die, Very Vanilla Seam binding ribbon, subtles buttons. I had some issues with the single photo that I took, so the next card is in a group of three. I couldn’t decide on which colour combination to go with, so I had a couple of attempts. I went with the card in the middle, using the gorgeous new Twitterpated DSP. Love it!! I also used the new Tea Shoppe stamp set which is so cute! I did case this card but again, can’t find the link!! 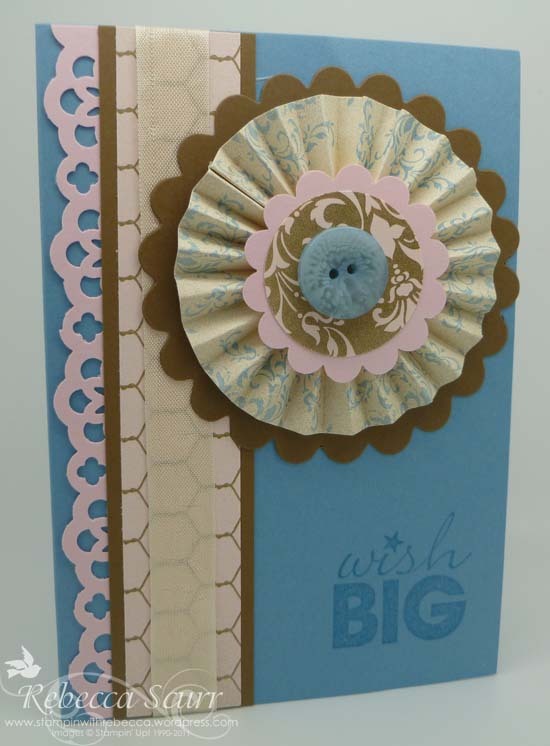 Accessories: Pear Pizzazz pleated satin ribbon, Adorning Accents edgelits, 1 1/4″ square punch. « 1 April 2012 – It’s here! !